France spent the later part of the 18th century fighting wars against the British in the New World, primarily the French and Indian War as well as the Revolutionary War. A tremendous military debt coupled with King Louis XVI’s perpetual lavish spending placed France on the brink of bankruptcy. Add that to years of disastrous harvests, droughts, and cattle disease, which left the people starving, and the country was ripe for rebellion. Recognizing the desperate situation, King Louis decided to convene an Estates-General, comprised of clergy (First Estate), nobility (Second Estate) and the people (Third Estate). Not assembled since 1614, the elected representatives gathered in Versailles on May 5, 1789. While the Third Estate made up over 95% of the population, from the poor to the middle class, and paid all the taxes, it was the first two Estates that had all the money, paid no taxes, and together could outvote the people. On the heels of the American Revolution, where the French supported the patriots and helped them win, they too had longings for freedom and liberty in France. Wanting to break free from their own tyrannical monarchy and nobles, the Third Estate quickly decided this was their time to act. The original purpose of the Estates-General was to discuss a proposed land tax, which would now include the clergy and nobility. However, it soon became a debate over equal representation by population, regardless of social status. While all orders supported the idea of a more representative government, many nobles resisted giving up their privileges. The Third Estate met privately on June 20th after debate stalled and they were locked out of the Estates-General three days earlier. Assuming the name National Assembly, they resolved to see their fight through. Meeting at a tennis court, they took a vow, known as the Tennis Court Oath, to remain in Versailles until a new constitution was achieved. By June 27th, most of the clergy, as well as some nobility, joined them, forcing King Louis to assimilate all three Estates into the new assembly. At the same time, Jacques Necker, a foreign financial advisor to the king, tried to win over the public by pushing for taxes for nobility and clergy. However, he also published exaggerated and false financial reports, resulting in his dismissal on July 11th and the king’s call for the complete remodeling of the finance ministry. King Louis also sent foreign soldiers to Paris to keep order, as French troops may sympathize with the looming rebellion. News of Necker’s dismissal reached Paris the next day where Parisians viewed it as an attack on the National Assembly, fearing its suppression by the king. Chaos quickly arose as the foreign soldiers began arriving and citizens took to the streets. A more neutral National Guard was assembled to protect the National Assembly from both the king’s men and the chaos from the riots. However, it was still charged to protect the royal family as well. Carrying swords, muskets and other weapons, mobs stormed the Bastille fortress on July 14th, looking for armory, ammunition and a recent shipment of gunpowder. The fortress had long been a symbol of royal power and its tyranny, as it often detained political prisoners along with ordinary criminals. Therefore, when the fortress’ governor, Bernard-René de Launay, refused to allow entry, the crowd took it as a personal attack. Even though the soldiers were holding off the crowd, de Launay soon realized their predicament. Their water was already depleted and their food supply would soon run out. Before long, they would be at the mercy of the mob. Therefore, he waved the white flag of surrender hoping for humanity. He did not receive it. De Launay ordered the gates to be opened where rioters flooded the inner court. They released the seven prisoners and seized de Launay. They dragged him towards the Hotel de Ville to discuss his fate, horribly beating him along the way. He eventually screamed, “Enough! Let me die!” To seal his fate, he kicked a rioter in the groin, to which the crowd repeatedly stabbed him until he died. Freedom and liberty for France looked inevitable at first, even to the king. A new constitution was constructed, eliminating noble and clergy privileges. Taxes were shared among the classes and rights were derived from citizenship, not birthright, though a monarchy remained in place. For a moment, there was peace between the people and the king. Many suggested the Bastille should be used to house the National Guard, now led by the Marquis de Lafayette. Lafayette, protege and good friend of George Washington, contributed greatly to the new constitution, sharing what he learned from Washington during the American Revolution. Others believed the Bastille should be maintained as a memorial to liberty. Regardless, the fortress was dismantled within five months. Lafayette had been given the key to the Bastille, which he sent to Washington and is displayed at Mount Vernon to this day. By 1792, radicals, led by Maximilien de Robespierre and others, believed the new government didn’t go far enough as the monarchy still existed. They attacked the royal palace, arresting the king and queen. This sparked the slaughtering of hundreds of suspected counter-revolutionists by Parisian insurrectionists, giving way to the abolishment of the monarchy and the formation of a French republic. King Louis and his wife, Marie-Antoinette, were eventually given mock trials, convicted of treason, and executed by the guillotine, as were so many others. While the frustrations and grievances of the French people mirrored the Americans at the time of their revolution, their courses of actions took two very different paths. While General George Washington willingly got on bended knee to pray to God for guidance, Robespierre forced thousands to their knees at the guillotine. (see God's Divine Providence) Washington fought for the liberty and freedom of religion preached about by the Black Robed Regiment in the decades leading up to the Revolution. (see Who Among You Is With Me?) On the other hand, Robespierre tried to eradicate Christianity and force people to confirm to his ideology. As the Founders worked with their opponents to find common ground and compromise, the French radicals eliminated that problem by terminating those who disagreed with them. 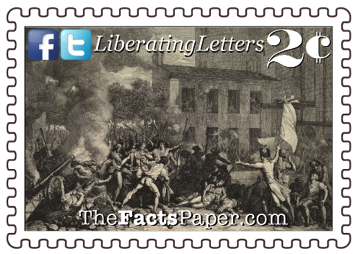 Liberty, both the British colonists in America and the French Third Estate had legitimate and understandable grievances with their leaders. The battles of Lexington and Concord could have very easily turned into a riot similar to the Bastille. (see The Shot Heard Round The World). Many believe it is purely by the grace of God that America not only won her independence, but a humble man like George Washington was our first president, setting the example of servitude over dictatorship. (see The Man Who Refused To Be King and God's Divine Providence). Unfortunately, America now finds herself again on the precipice of another revolution. Those in Congress have convinced themselves they are nobility, free from the taxes and laws they perpetuate upon the people. There is no mistake that the election of non-politician Donald Trump is a form of revolt by the people. We must pray the people wake up and step back from the cliff before we throw away everything we have fought so hard to have. Because this time, we may not be so lucky. This time may be our Bastille moment, which results not in a Washington, but in a Napoleon.